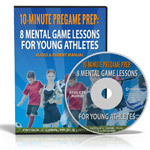 Often, young athletes don’t understand the benefits of mental game training. They say they’re already mentally strong. Or they’re afraid that they’ll have to sit on a couch and reveal their innermost vulnerabilities. Mostly, they don’t understand what mental game training is–or its benefits. 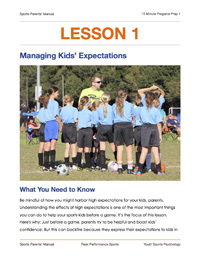 To help sports kids embrace the benefits, let them hear from the pros. The pros know: A strong mental game is key to succeeding in any sport. Stephen Curry talked about how he treats pressure, turning anxiety into excitement. He said, “I’ve never been afraid of big moments. I get butterflies – I get nervous and anxious, but I think those are all good signs that I’m ready for the moment.” That’s an important mental game strength! These quotes address important mental game skills: knowing how to make anxiety work to one’s benefit; understanding the importance of staying composed; and knowing what to focus on when the stakes are high. If you help your young athletes understand the benefits of mental game training, they’ll embrace the mental game, which can boost their confidence and improve performance consistency. Daniel Crosby said, “Dreams are so important. You need to have big goals and expect a lot of yourself, but you have to enjoy the ride too,” echoing the message that without enjoying the process, athletes won’t succeed in the long term. If you’re athletes don’t embrace mental game coaching, you might share a quote from one of their idols. What athletes don’t understand, they don’t embrace. Mental game coaching is an important part of every athlete’s performance improvement program. And at the same time, your athlete learn life skills that can be applied beyond sports.